Several Oakland police officers also defy policy on wearing body cameras. 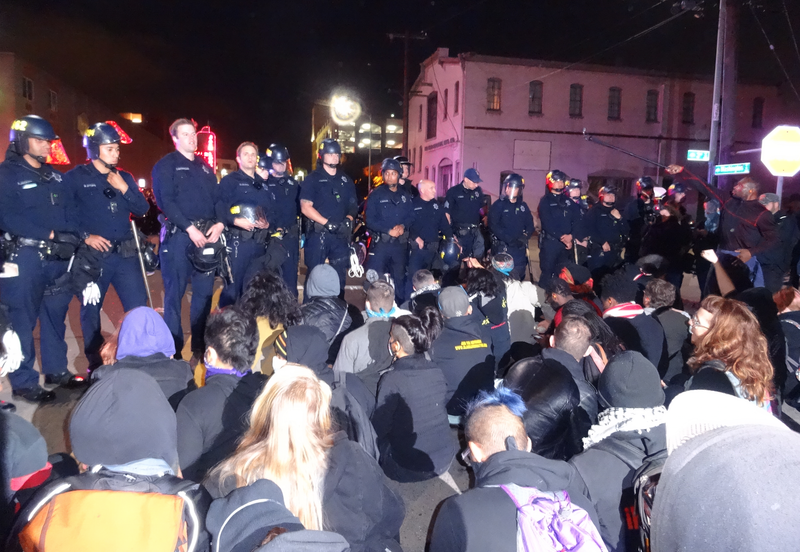 Oakland police enforce a nighttime ban on street marches by detaining dozens of demonstrators. 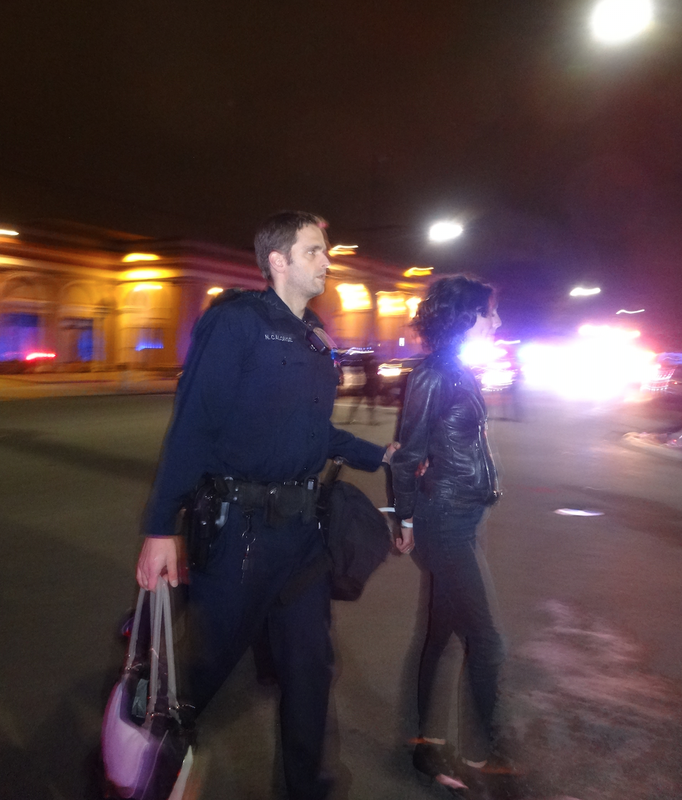 Oakland police last night detained 52 peaceful demonstrators — including Oakland Planning Commissioner Jahmese Myers — who were protesting Mayor Libby Schaaf's new controversial policy banning nighttime street protests. In addition, numerous Oakland police officers appeared to openly defy the department's policy of wearing body cameras. Just after sunset on Saturday, approximately 150 demonstrators marched from 14th Street and Broadway to the Police Administration Building and then to Jack London Square, taking over the street to protest the new ban. At least one demonstrator was arrested on Broadway. Lieutenant Randell Wingate said the person was arrested for refusing an order to walk on the other side of the street. Under the mayor's new policy, which civil rights attorneys say is illegal, demonstrators are not allowed on city streets after dark and can only march on sidewalks. The mayor has said that the ban is designed to end vandalism during protests. The Oakland Police Department deployed a large force of officers to follow the demonstrators. No vandalism was apparent, however. The rally was organized by the same group of Black women who attempted to march on Thursday night but encountered the first enforcement of Mayor Schaaf's new nighttime street marching ban. 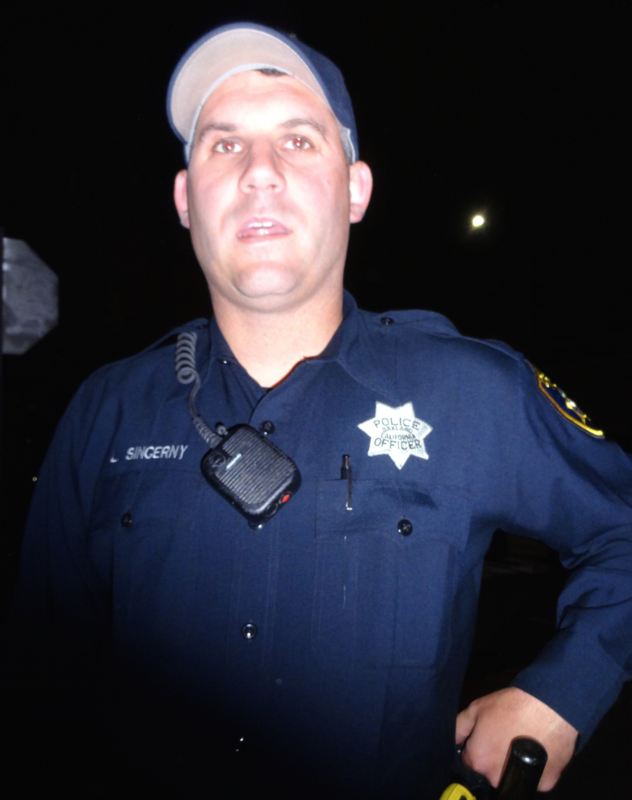 Oakland police officer Luke Sincerny put his body camera in his pocket after he said it ran out of batteries. Cat Brooks, one of the organizers, told the protesters that Schaaf is trying to “quell the resistance” of Black people against police violence. “We're not going to walk on sidewalks,” said Brooks. At 9:00 p.m., police blocked the march from moving forward at the intersection of 3rd Street and Washington in the Jack London district. Demonstrators attempted to push their way through the police line. They maintained that the nighttime ban is unconstitutional and violates OPD's own crowd control policy. During the scuffle, several protesters were pulled behind police lines and detained. OPD then declared the march an unlawful assembly and issued a general warning that chemical agents would be deployed. A team of OPD officers, Alameda County Sheriff's deputies, and CHP officers ran behind the protesters, trapping many of them in preparation for a mass arrest. 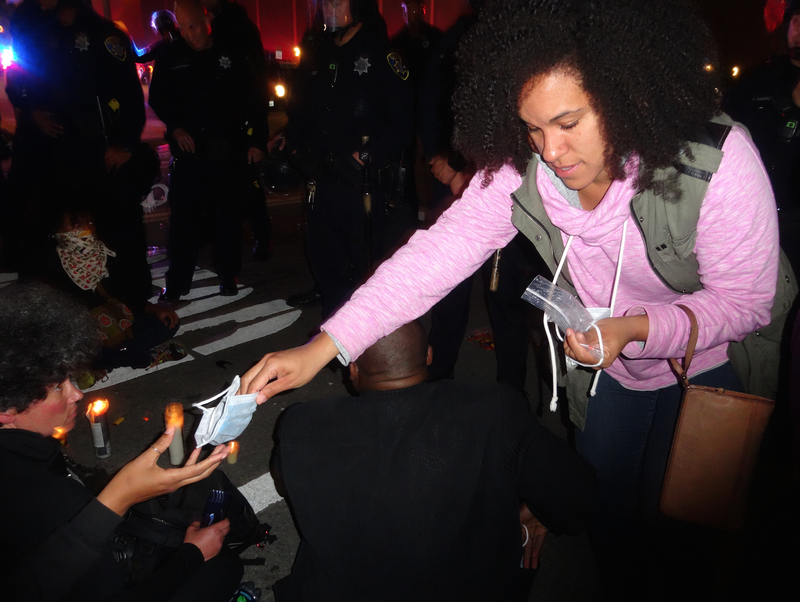 Protester Jahmese Myres hands out masks shortly after OPD deployed CS gas canisters behind the police line. The demonstrators then sat down in the street in an act of civil disobedience. Some were led away on their feet, while others were carried. According to OPD, 47 people were detained and cited and 5 more were arrested. It appeared that nearly all of those cited were physically detained and cuffed. The citations were for violation of California Penal Code 409: unlawful assembly. OPD did not say what the five who were arrested are being charged with. Mayor Schaaf's office was not available for comment, and a public information officer for the Oakland Police did not release a statement until several hours after the demonstrators were detained and arrested. Oakland Police Officer Nicholas Calonge did not appear to be wearing a body camera. During the evening, it was apparent that multiple Oakland police officers were not wearing, or did not activate their body cameras, as required by the department's own policy. Geoffrey King, an attorney, journalist, and press freedom watchdog was on scene and tweeted that he observed “at least half a dozen OPD officers with no body cams whatsoever.” King also tweeted that police officers had threatened to arrest journalists — a move that also would have violated city law. The Express also observed multiple officers without chest cameras, and some whose cameras were clearly not activated. Sergeant Daniel Royal was not wearing a camera. He said it was broken. Officer William Berger was also not wearing a body camera. He said his camera "fell off" during the protest. Officer Luke Sincerny said his body camera was in his pocket, but that he wasn't wearing it because it "ran out of batteries." Police officer Nicholas Calonge could be seen searching a woman's bag after arresting her. Calonge did not appear to be wearing a body camera. Multiple other officers who were not wearing body cameras could be observed arresting and transporting people. It seems clear that demonstrators will continue to protest Mayor Schaaf's new nighttime ban and that her new policy is resulting in more demonstrations. Councilmember Desley Brooks attended the first half of last night's march. Standing in front of the Police Administration Building, Brooks said "it looks like the mayor's order didn't work." Already there is another protest planned for tonight in downtown Oakland.